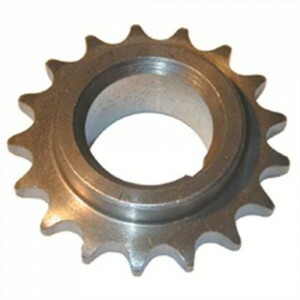 This is the standard single-row crankshaft sprocket for the Ford 1600 Kent engine. The timing chain and sprockets wear together, and the sprocket teeth should be inspected every time the timing chain is replaced. Worn teeth can result in unpredictable cam timing, which also affects ignition timing. Severely worn teeth can also shorten the life of the timing chain. The sprocket should be removed from the crankshaft when the crank is sent to the machine shop for grinding.